Last week, the professional social network LinkedIn invited its “thought leaders” and other content contributors to write about the best — most counter-intuitive – mistakes they had ever made. It was pretty tame stuff, nothing controversial: “My Best Mistake: Nearly Getting Fired”, or “My Best Mistake: Forgetting the Five-Year Career Plan”. 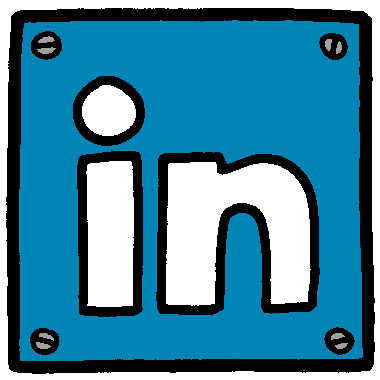 On Thursday, however, a LinkedIn user made his own big mistake – and something tells me it wasn’t his best. If it was? Have mercy. 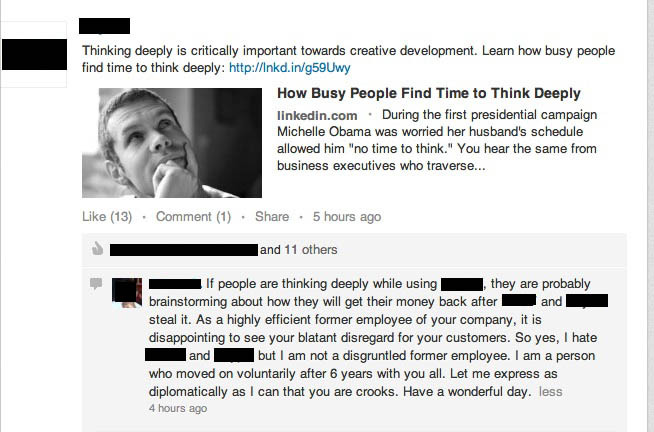 On that day a large, established eCommerce/payments company posted a story, as firms and individuals on LinkedIn often do, titled “How Busy People Find Time to Think Deeply”. Again, innocuous stuff. Most of us are busy, and who among us wouldn’t appreciate more time to think deeply, right? Completely floored, I sent the link to friends, encouraging them to click on it only if they weren’t squeamish about professional suicide. None of us could conceive of why someone would be so hell-bent on offending both his previous employer AND anyone else who might possibly think of hiring him. What was he trying to accomplish? Would you make an offer to someone who holds such consuming grudges, and voices them so recklessly? Someone who might leave your employ, then paint you as dishonest on social media? What drives folks to self-destruct on social media this way? I mean, we’ve all heard stories of knuckleheads who call in sick, then tweet photos of themselves doing keg stands on the beach. Or who unload on their toady bosses on Facebook, and are summarily fired. Still, I think this one takes the cake. If not him, then maybe the unimaginative guy who piled on with, effectively, “Yeah, what he said”. In the words of Forrest Gump…Stupid is as stupid does. Aside from the obvious sarcasm in his “have a wonderful day” sign off, you’ve got to love that this guy doesn’t consider himself a disgruntled former employee. Really? If his bridge-burning behavior doesn’t scream “disgruntled”, I don’t know what does. Plus, I think he protests that he left the company voluntarily just a smidge too emphatically. I’m just not buying it. Here’s hoping the poor fellow has some friends who can appeal to his better judgment – assuming he possesses any – and convince him to remove the comment. It had to feel GREAT to blast his old bosses this way, but by now he has probably received quite a few concerned emails asking if he has completely lost his mind. My Dad once told me a story of a colleague who, many years ago, got drunk at the office Christmas party and told off his bosses. Within a week, he was transferred to someplace like North Dakota. In the dead of winter. Going out in a blaze of glory can sound cool, but pack your suitcase wisely… exile can be a cold place. Have any good bridge-burning stories? Share ‘em if you’ve got ‘em.